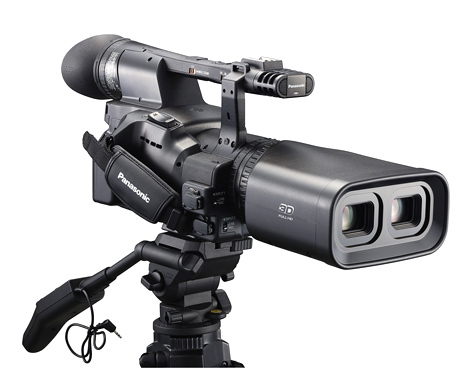 Panasonic AG-3DA1 3D Camcorder: $21,000. Panasonic AG-HMX100 3D-Ready Mixing Board: $5,800. BT-3DL2550 3D-ready production monitor: $9,900. Shooting your daughter’s school play in 3D: Priceless. Wait, no. That’s actually $36,700. Get your checkbook ready and prepare to make the most spectacularly boring 3D movies ever: the first 3D camcorder finally has full specs and is available for preorder. The 3D camcorder Panasonic announced at CES 2010, now known as the AG-3DA1, will go on sale this fall for $21,000 as expected. To accommodate for 3D productions, Panasonic also announced an accompanying 3D A/V mixer and 25.5-inch 3D field monitor. The AG-HMX100 has been designed to accommodate live events, and includes four HD/SD-HDI inputs/outputs, two HDMI inputs and two analog composite inputs, plus DVI jacks for computer monitors to supplement the built-in 5.7-incher, microphone inputs, and audio outputs. It will go on sale in June for $5,800. The BT-3DL2550 3D-ready production monitor offers a 25.-5inch screen and uses a polarizing filter to let viewers use passive glasses, rather than the active models typically used with TVs. It will go for $9,900 this September.